SITTING on the beach in St Lucia watching the waves crash onto the white sand just six weeks after booking a Caribbean cruise was a proper pinch yourself to believe it moment. We hadn’t really thought about this year’s holiday until New Year’s Day, when we had some news that just made us want to make the most of life. So with little research, and after a lunch break phone call to P&O to price up a transatlantic cruise we booked what the rep described as the holiday of a lifetime. 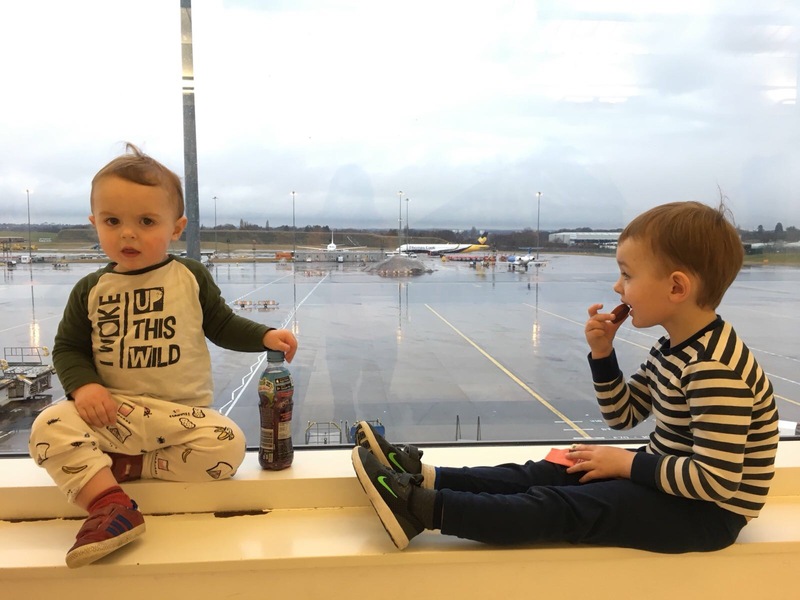 We just had to get through a long haul flight with two boys under four before the holiday could really begin. 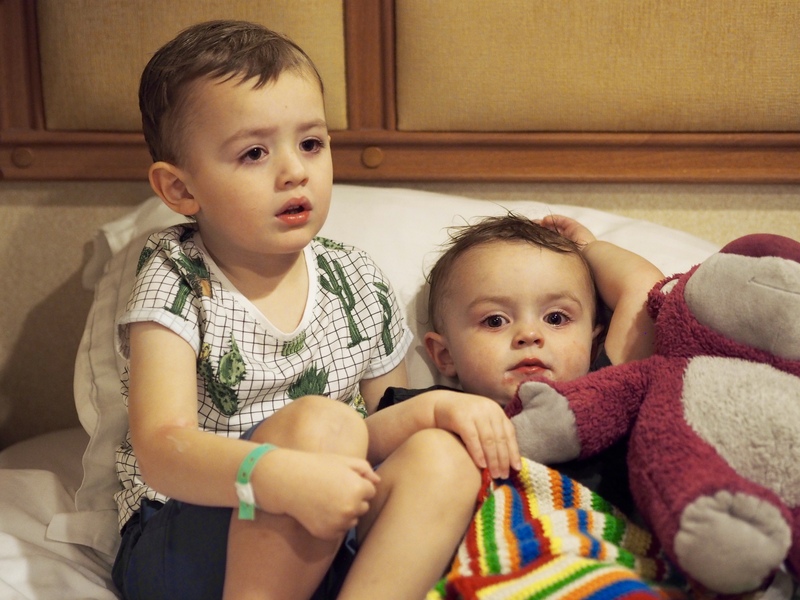 It was a 1.45am wake-up call, and the plan was to throw some clothes on, quickly get the cases into the car and bundle the boys into their car seats without waking them. But of course the best laid plans go to waste. Both boys were wide awake on seeing my father, who was giving us a lift to Birmingham Airport, and hardly slept a wink all the way there. My hopes of getting an extra couple of hours sleep in during the journey were well and truly dashed. We’d booked our cruise with P&O, who’d chartered a flight to Barbados. 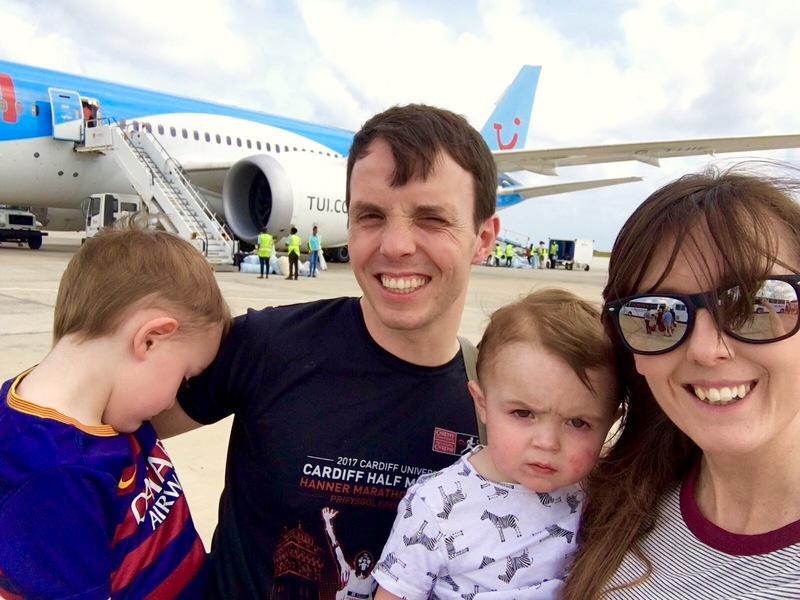 This meant everyone who was on the flight would be on the cruise – there weren’t many families, and even fewer with young children, so we stuck out a bit – but it also meant that once we’d checked in our luggage we wouldn’t see it again until it arrived at our cabin. That was a relief! Even after getting rid of our cases we were left with a buggy, buggy board, Trunki and two hand luggage bags, so we were still pretty well weighed down! 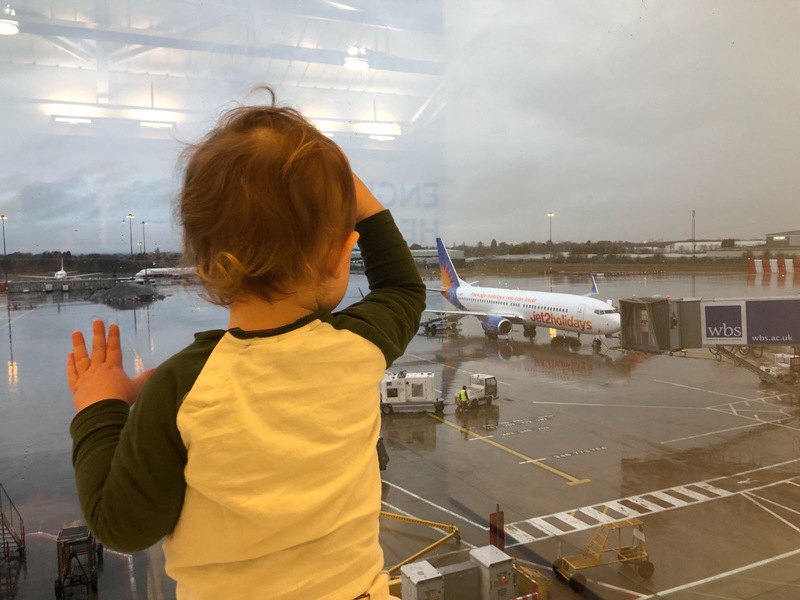 By the time we got through security the boys were ready to run around, and the littlest swiftly made his way through the staff barrier behind the x-ray machines, clutching his blanket that they’d taken from him to scan (leaving him inconsolable), and the iPad that he’d spotted in Stew’s hand luggage. Minutes later, as he scuttled through the duty free shops, the iPad took a tumble and shattered. That’s one way to limit screen time! Surprisingly, after all this, the flight went better than expected. We were split into two on the plane – me and the boys together on the window side, and Stew in the aisle seat of the middle row. He promptly put in his head phones and scrolled through the film selection, while I got the boys into their seat belts, dished out snacks and toys, and generally tried to keep them under control. 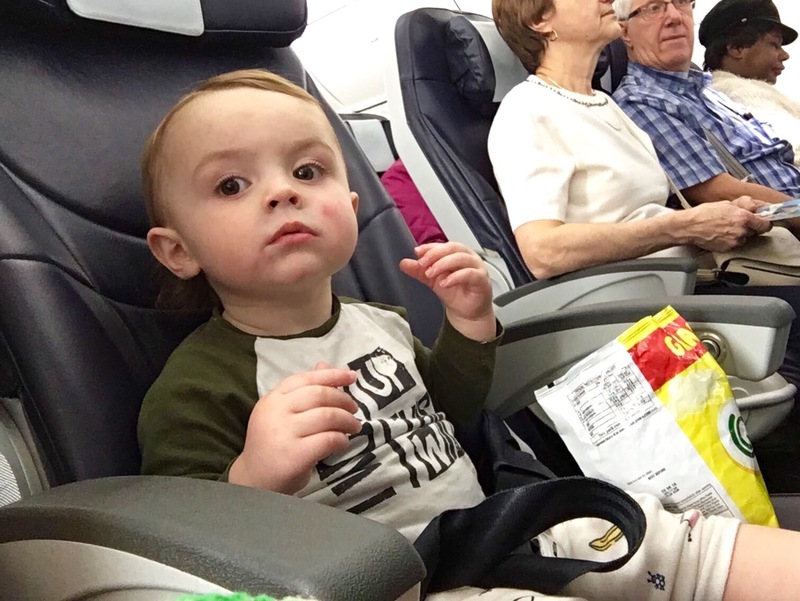 Being under two, we hadn’t expected our youngest to get a seat of his own, but because it was a charter flight we were allocated a seat each. This gave us a bit more space, which was very welcome, although he still wanted to sit on my lap for take-off, and we spent a large part of the flight with four of us squeezed into three seats. 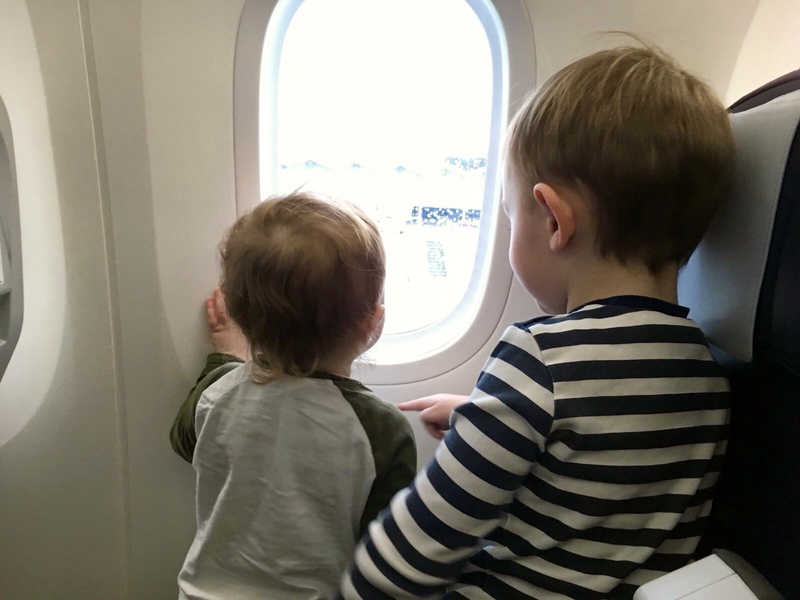 The boys were very excited to finally get on the plane, and soon discovered the interactive windows on board, which changed colour from clear to dark blue at the touch of a button instead of having the old fashioned pull-down blind. The Quavers were a good idea for keeping them still! Ok, I have to admit I was a bit suspicious that something was going to go horribly wrong with such a good start to the flight. It’s ok, we had 8.5 hours for things to take a turn for the worse. I was right. Well, kind of. 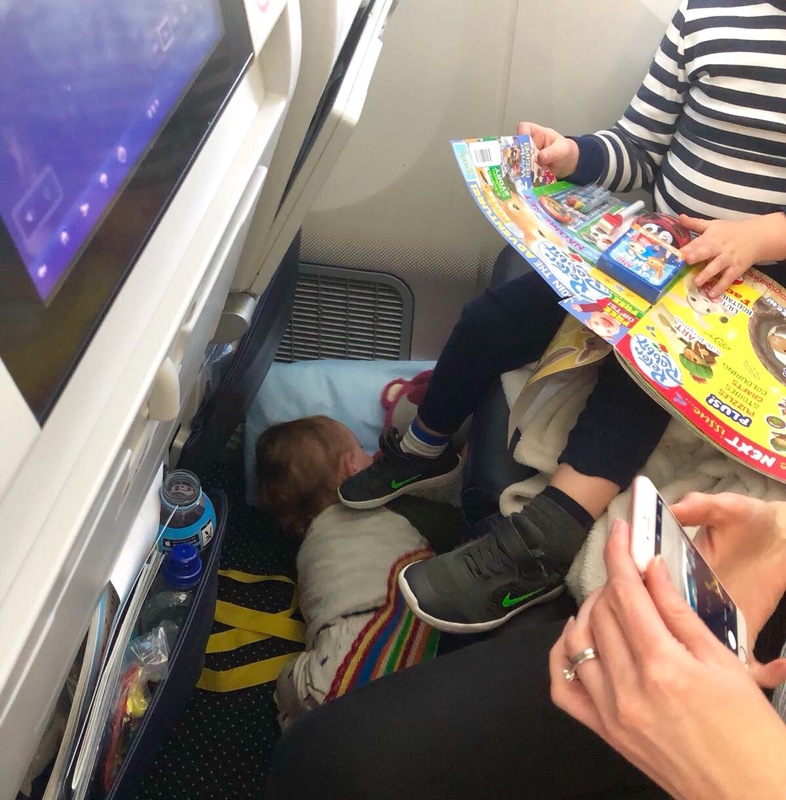 It would be an exaggeration to say things went horribly wrong, but having a toddler who woke after just half an hour, so determined to get through the curtain to the premium economy area that he was crawling under our legs to escape, while our three-year-old chanted “GO, GO, GO” wasn’t exactly ideal … not when we were sharing a plane with the target audience for champagne “to get the holiday off to the right start”. Once we’d eaten our lunch I checked the time, thinking “this is going well”, only to realise we had 5.5 hours to go! Like I said, it could have been worse. We made it to Barbados in one piece, and as people were passing our row to get off we had a few comments about how good the boys had been (just not from the passengers immediately around us!). I might have ended up with a whole Frube down my jeans, the air stewardess practically broke open the toilet door because she thought me and the littlest were locked inside, and the biggest was led off the plane by a woman who for some reason thought I was getting off without him … but at least we were sailing home and didn’t have to board another flight! After finally touching down, it was time to breathe in the Caribbean air. It was that amazing feeling when the heat hits you as you step off the plane. I hadn’t felt that since our honeymoon in Cuba five years ago to the day. We hopped on a bus and were whisked away to Bridgetown port. As I said earlier, our luggage was brought from the airport to the ship, so there was no faffing around waiting at the baggage carousel, and no passport control until we arrived at the cruise check-in desk. Our bus driver pointed out some of the sights as we drove through, and after about half an hour the Azura was in sight. Some passengers, I’m not sure how many, had got on the day before, and one flight was delayed by 11 hours, so it was only our flight load of people to check onto the ship. We were presented with flower garlands, had our photo taken for our cruise cards and were soon on board. I honestly couldn’t believe how quick it was. We headed to our cabin – an inside room on deck 12 – and I was relieved that it was slightly bigger than the last time we were on the Azura. Then, the travel cot was between two single beds, with no room to walk around, while this time there was space for it at the end of one bed which seemed to make a huge difference. We did end up moving it out of the bedroom area and into the open wardrobe space so our littlest wasn’t disturbed if we had the light on or the biggest was watching a film in bed, which meant no floor space was taken up by the cot. Our luggage hadn’t arrived yet, so we went for a wander around the ship, had a bite to eat in the buffet and signed the biggest boy up for children’s club. As our youngest is under two, he couldn’t go to club, but we signed him up to use the play room and night nursery, which meant we could leave him there if he fell asleep during the evening. This was where things got tricky and the day really did take a bad turn. By this point we’d been awake for nearly 22 hours (the biggest boy included as he didn’t fall asleep in the car or nap on the plane) and had to get through the muster drill (where they take you through the emergency procedure, show you how life jackets work, and give you a bit of an introduction to the ship – no fun for children, especially tire ones). There was about a 30 minute delay, and by the time it started both boys had had enough. Tantrums because I said they couldn’t blow the whistle on the life jacket, crying because they wanted to go, and eventually both fell asleep – the biggest curled up on my lap on the floor, and the littlest in Stew’s arms. I did wander what we looked like at this point … quite a sight I’d imagine! With everyone attempting to get in the lifts, we ended up walking up to our room, both of us carrying a sleeping child and attempting to manage four life jackets between us.